When I saw it, I immediately thought of my friend Deb. We’ve know each other since 9th grade – I say that’s since God invented dirt, but Deb claims it’s since the beginning of all time. We are both blessed with brothers, so we also recognize one another as the sisters we should have had. Yes, it’s that kind of friendship/kinship/sisterhood. A few years ago, Deb went with me to the Dallas Quilt Show, which is when I bought fat quarters that weren’t in my normal favorites range for colors or prints. Don’t know why I bought them, but I figured there was reason, so I put them aside until the reason presented itself… scrap-logic all quilters understand. And, lo and behold, the reason presented itself when I saw the Beatitudes panel last summer at the Plano Quilt Show. The fat quarters, the Beatitudes, the randomness/precision design… it all came together in a single weekend to make a Blessing cover for Deb. And the name of the Quilt? “Friendship is a Blessing”. Here’s hoping my story brightens your day, Sarah. Take a look at this beautiful quilt – and may it inspire you to make something lovely for a friend or loved one this weekend. Customer Testimonial – She loves us! We received the sweetest email the other day from a great customer. She met us at a quilt show not long ago, watched Karen’s demo, and went right home and put her new knowledge and products to work. I received the ultra weft! I just want to tell you thanks for the easier way to put my quilt together with spray and pvc pipe! I actually put my california king quilt together that I had been procrastinating about cause I just couldn’t bring myself to deal with all those pins and the hassle of trying to sandwich batting, backing and top on my small table in the mobile home I live in. AND the taping techniques for the quilting worked so much better. So my quilt is done waiting for the binding but that’s not a problem. So thanks, thanks thanks!!! 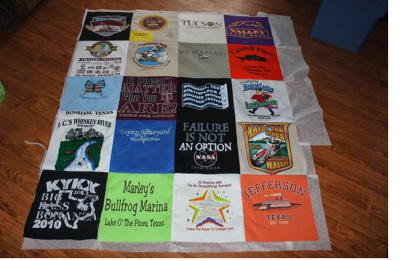 We wanted to share her sweet words, along with the beautiful quilts that she has made! At our recent show for the Plano Quilt Guild, we got to see and visit with one of our good customers, Peggy. 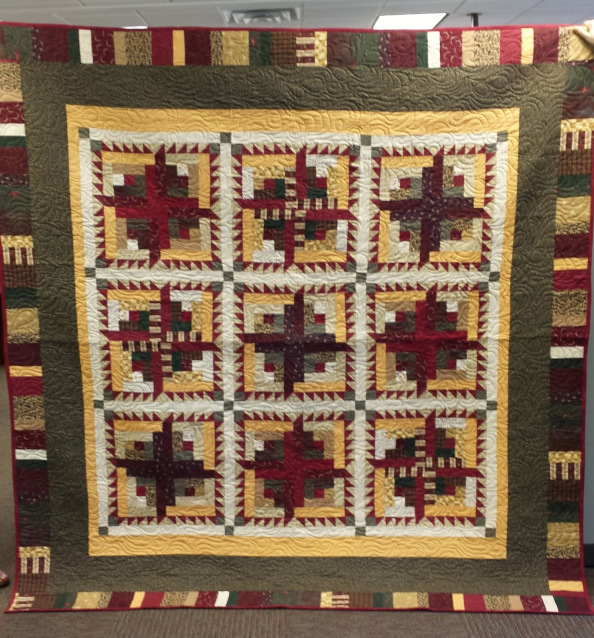 She had told us that the fabric she bought from us at another one of our shows had turned into a beautiful Saw Tooth Log Cabin Quilt. And she was right. 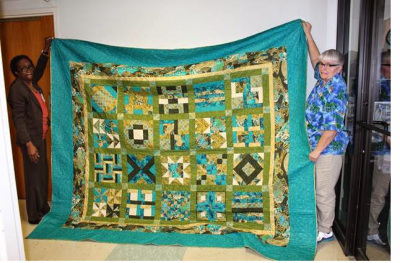 Check out this GORGEOUS quilt she made using Moda Fabrics. 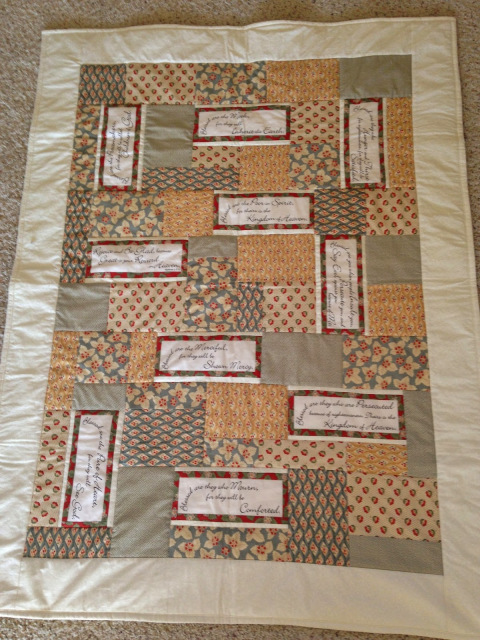 Along with the quilting done by Richard Larson, she now has a treasured keepsake to last for generations to come. Remember, send us your pictures of what you have made and we will brag on you too. Email them to me at ksmisek@homealamode.com or just post them to our Facebook page at www.facebook.com/homealamode.